Some of you may be asking what the heck is a Plout? The Pluot, a cross between a plum and an apricot, looks like a plum. But tends to be a bit more meaty and tastes more like sweet honey. Not to mention it’s gorgeous red color, hence the name. I had bought a bunch from the farmers market and was trying to come up with a way to incorporate them into a salad. Here you have it! I just love main dish salads and there is just something about fruits in salad I just love. 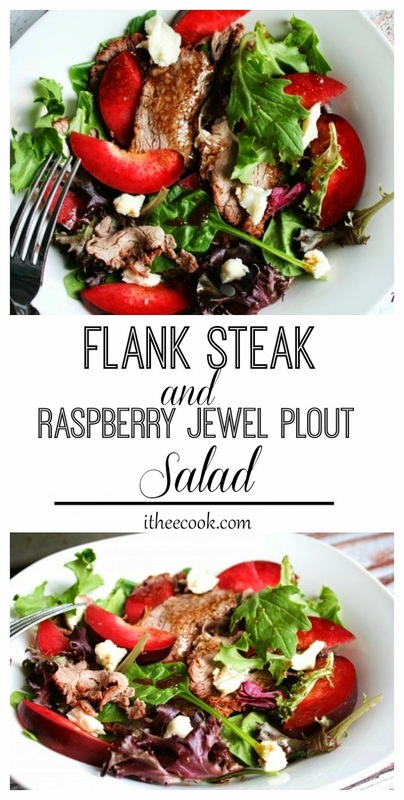 You have warm steak, sweet pluots and the zip of the dressing all along with creamy goat cheese pieces. That my friends is one heck of a dinner. Better yet serve it for friends on a platter; they will be impressed. Combine pepper, ¼ teaspoon salt, 1½ teaspoons olive oil, rub over both sides of steak. Heat a large skillet over medium-high heat. Coat pan with cooking spray. Add steak to pan; cook 5 minutes on each side or until desired degree of doneness. Remove steak from pan; let rest 5 minutes. Cut steak diagonally across grain into thin slices. Combine remaining 1 tablespoon olive oil, lemon juice, aged balsamic vinegar, honey, and salt in a large bowl; stir well with a whisk. Add greens; toss gently to coat. Arrange about 1½ cups arugula mixture onto each of 4 plates; top each serving with 3 ounces steak, about ½ cup plums, and 1 tablespoon cheese. So yummy and bright! I've been to the farmers' market several times, but don't remember seeing a plout. I'll seek it out next time. It's a very interesting fruit! Thanks for sharing your salad at Inspire Me Mondays!